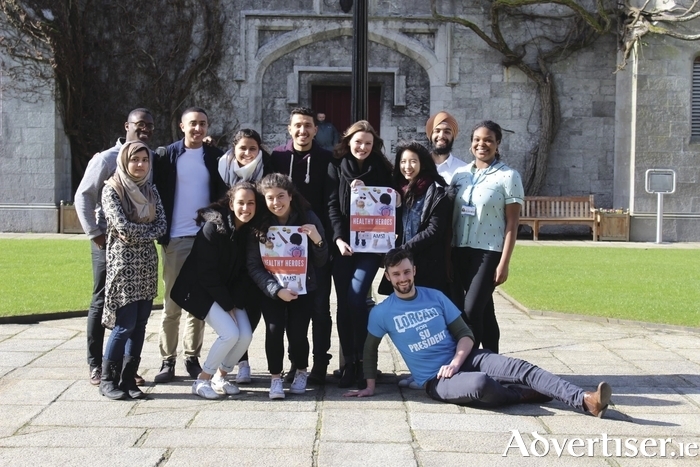 The team from NUI Galway’s Paediatric Society and the Association of Medical Students Ireland (AMSI) promoting the event. NUI Galway’s Paediatric Society and the Association of Medical Students Ireland (AMSI ) are co-running a two-day event titled ‘Healthy Heroes’ to promote child and adolescent health. They have invited a total of 400 local primary school and transition year students to attend interactive workshops surrounding healthy habits, on November 8-9th at NUIG’s main campus. The aim is to promote the health and well-being of primary and secondary school students in the hopes that they will learn essential knowledge and skills that will help them to consider their health when making daily choices. Core skills will be taught through small group activities, and will begin with an introductory powerpoint presentation or expert speaker. The session facilitators are all volunteer NUI Galway healthcare students. These subjects were chosen in response to Ireland’s most pressing needs for youth at present: mental health promotion, alcohol and drug safety, and obesity reduction. One in four deaths of young men aged 15-39 in Ireland is due to alcohol, and it is a factor in half of all suicides in Ireland. The organisers chose to also focus on mental health promotion, as one in five young people in Ireland is experiencing a mental disorder. Basic Anatomy & Physiology- this will be taught by Cell EXPLORERS, the NUI Galway School of Natural Sciences outreach programme that engages young people in cellular and molecular biology. These lessons will be interactive and interesting, with handouts and goodies for the children to take home. This is to ensure that what the children learn can be shared and discussed with their family at home. Feedback from the participating student volunteers and school teachers will be collected, to evaluate the success of the project. This event will benefit the volunteer healthcare students that will be in contact with the children. Volunteers will be able to gain hands-on experience and gauge whether a career in paediatric medicine, paediatric nursing and so on would suit them. This is the NUI Galway Paediatric Society’s second year as an established group - comprised of college students that hold an interest in child health. AMSI is a national organization under the umbrella of the International Federation of Medical Students Association (IFMSA ), an NGO committed to promoting wellness, communication and education of medical students worldwide. This outreach initiative is a follow-on from last year’s school visits “Healthy Heroes” initiative that were carried out locally. They would like to acknowledge the sponsors: French Vanoli School of Fitness, Fyffes, Glenisk, Smiles Dental, Cell Explorers, National Dairy Council, NUI Galway Cancer Soc and of course NUI Galway. Any queries can be made to Rosie James at [email protected].